First, picture an iceberg and remember what we were taught as kids; only a small part of an iceberg is visible above water. The tip that we see seems like the entire iceberg, but it’s actually less than 10 percent of its mass. 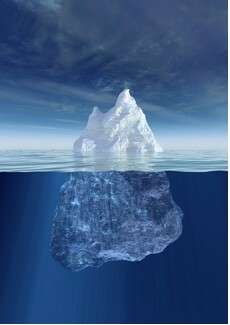 The formal aspects of an organization (e.g., mission, goals, policies, procedures, physical facilities, and financial resources) are the iceberg’s tip, floating above the water. Everyone pays attention to the tip without remembering that what lies under the water—the human, cultural, informal aspects of the organizational culture. These aspects often control the organization. The answer lies in the leaders’ ability to articulate the application of the TJC model; but more importantly, institutionalization is won or lost based upon what the leaders actually do. When implementing a model that requires change, leadership modeling is essential. Even a very articulate, charismatic leader who says all the right things cannot fool people into buying into and integrating these practices unless the leader lives, eats, and breathes the model on a consistent basis. 1. 1. Christensen, Gary, E. 2004. Leadership within Corrections: The Creation of Learning Organizations. Corrections Managers’ Report. Available: http://www.correctionspartners.com/articles/Lead_w-in_corr.orgs_learning_orgs.pdf.